Some meetings are easily planned and rather informal, especially if the delegates are known to each other and meet frequently. Other meetings such as conferences, seminars and training days, require more time and effort to bring about successfully. For such meetings it is important to have a plan. Depending on how many are attending, what the meeting is about and how important it is, you may need to begin planning several months in advance. Set up a project group to organise the meeting. Identify roles and responsibilities, ways of working and contact details. Set out the objectives and goals. Agree a timeline, milestones and deadlines as well as each member's time commitments. Prepare a detailed Gantt chart showing sequences, timelines and tasks. 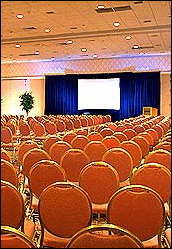 Prepare a venue checklist with what the venue needs to provide for this meeting. Research venues, check availability, ask for quotes, prepare a shortlist. Confirm attendance and send out location/travel details. Finalise entertainment and social events. Check audio visual and computer equipment. Arrive at the meeting venue early to ensure everything is in order. Check that the meeting rooms are clean, seating arranged, aircon/heating set at a comfortable temperature, good lighting. Check all equipment and power points and report any faults immediately to the venue maintenance staff. Find out who to talk to if anything goes wrong with the equipment during the meeting. Double check that your catering, accommodation and entertainment requirements are known and will be met. Find out who to talk to if something isn't right or you need something extra during the meeting. Ensure that someone is on hand at the entrance to greet the attendees as they arrive and get them settled. B2B Event Management based in Berkshire UK has over 17 years of experience offering a high quality and value solution to your event planning and implementation at a competitive cost. B2B Event Management will create and deliver your total event management requirement regardless of the size of the event. Bright Ideas Event Planning - Multi-award winning company providing corporate event planning, coordination and production services for theme galas, acquisitions, corporate picnics, and more. Based in Vancouver, BC, Canada. Event Management Software - Mission Event Software Ltd has been offering event technologies to event organisers throughout the world for over 15 years. The company provides clients such as government bodies, associations, major corporations and professional conference organisers with leading, award winning software solutions. Mimosa Catering London caterer delivering freshly prepared food for board meetings, training sessions and lunch meetings. Also do event catering and weekday office lunch delivery.